Hi! I’m finally blogging about my Europe Winter trip last December. 8 months late, but just in time for Winter! So last December, I decided to fly over to Europe to visit Mr Gan who is studying there. However, instead of visiting his place of study, UK, we decided to travel Northern Europe, in particular Scandinavia instead, because UK is all gloomy during Winter whereas Scandinavia is known for its picturesque view during Winter. We visited many cities, from Frankfurt to Dusseldorf to Brussels to Amsterdam to Tromso to Stockholm to Gothenburg and finally Copenhagen. 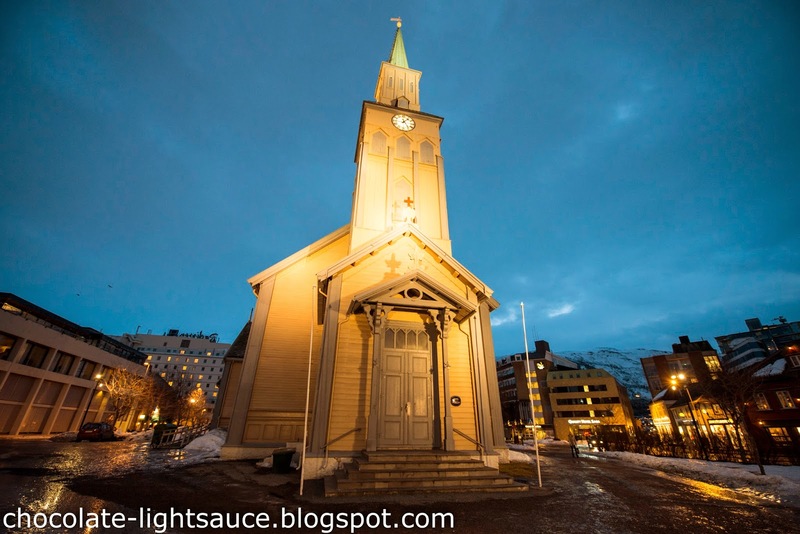 Decided to skip the rest first and jump straight to Norway – Tromso because that’s my favourite. 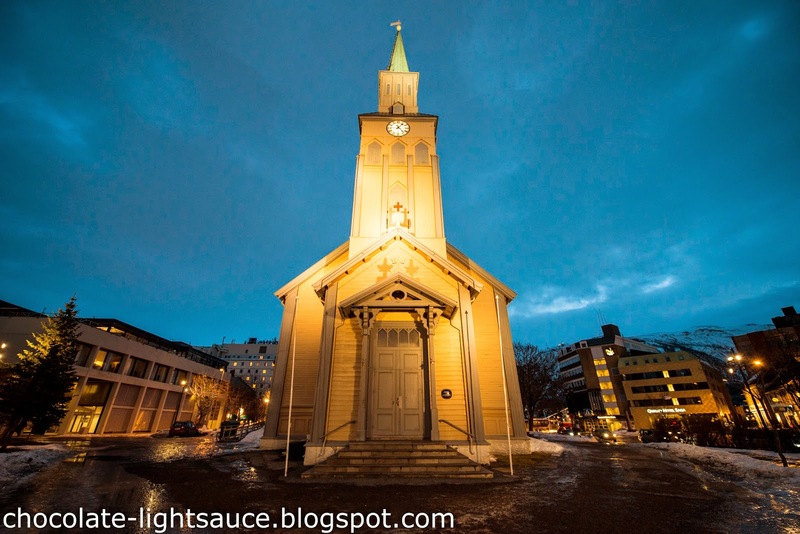 There are basically 3 ways of getting to Norway – Tromso from other parts of Europe, (i) Airplane (ii) Car and (iii) Cruise. There’s no train to Tromso. As we were travelling other parts of Europe prior to going Tromso, we chose to take an international flight from Amsterdam, transiting at Oslo. If you are flying there straight from Singapore, you got to transit at one of the major airports (e.g. Amsterdam, Copenhagen, Stockholm) as there is no direct flight to Norway from Singapore. Alternatively, you can choose to drive up from Oslo. We didn’t because it will take ages and we aren’t too comfortable with left side driving + winter icy ground + winter twilight mode. Lastly, you can also cruise up from Oslo. 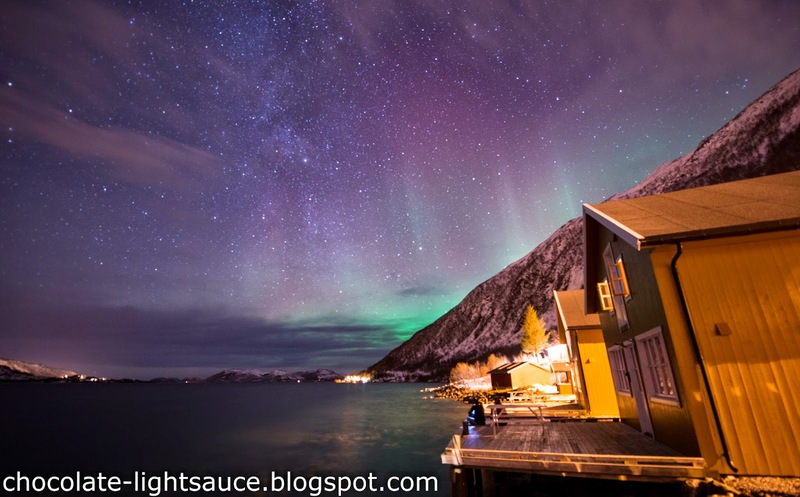 It will probably take 3 days to reach Tromso, but it’s quite expensive. We flew with Scandinavia Airlines (SAS) because it’s the cheapest, but still quite expensive for a 1.5 hour flight. Around $200-$300 SGD per pax for return airfare. 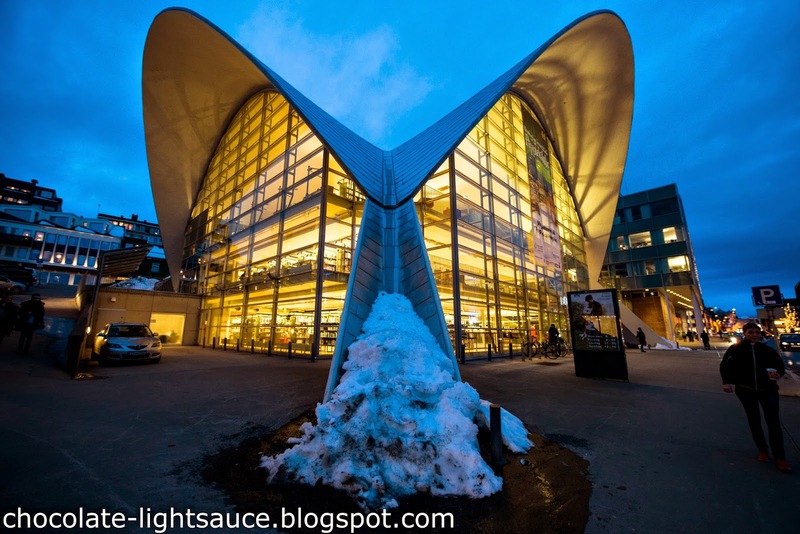 We spent our time at Oslo’s airport during the transit because the train out to Oslo’s city center cost around SGD$100 per pax. We did our math and concluded that it wasn’t worth it as we only have a few hours to spare. It’s a rather small plane and the flight took a mere 1.5 hours. They also serve free coffee/tea/water on board which is quite nice :D.
To say the truth, the city center was quite boring to us. 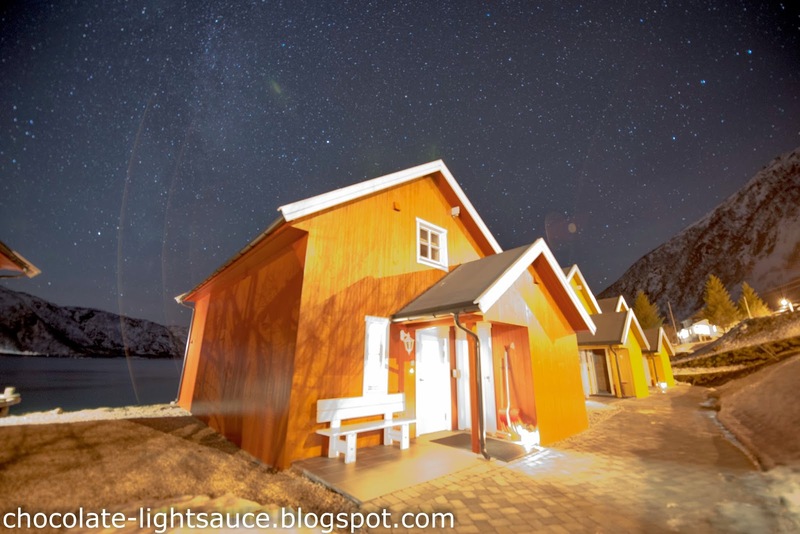 The only reason why we chose to stay there for 1 night was because our flight reached Tromso quite late and we concluded that it’s not very worth it to pay an additional SGD$200 to stay around the Fjords just to sleep. In addition we thought that we might as well check out the city center. Regardless, the city center is still the main choice for tourist because it’s a lot more affordable and most activity groups (e.g. northern light chase, dog sledding etc) will arrange for buses to fetch the participants from the city center to the destination. And to reach the city center from the airport was a task. Naturally there’s taxi which cost around 180NOK (approx SGD$40). Alternatively you can choose to take a bus (citybus 42 or 40) which cost 45NOK (SGD$10) for 1 person. The entire journey took around 30 minutes. We chose to take the bus to not explode our budget too much. The most difficult thing about taking the bus is finding the bus stop at the airport. Let me try to explain where’s the bus stop located. There’s only 2 exits at Tromso airport and both exits face the same direction. You can take the exit above, next to the 7 eleven, and once you are out, turn right and follow the winding pavement down. Then as you reach the end of the pavement, you should see a indoor car park on your left hand side. Walk towards the indoor car park and into the indoor car park. Continue walking for around 30s and on your right hand side you should see a bus stop opposite the road. That’s the bus stop. We sort of missed our stop to alight, but with the help of googlemaps, we managed to reach our hotel in the city center - City Living Hotel. Which was a delight. I truly enjoyed my 1 night stay at City Living Hotel. It’s an apartment so it comes with a fully equipped kitchen (fridge, oven, stove, pots and pans etc), 1 bathroom, 1 living room and 1 bedroom. And no carpeted flooring (Yes! Hates carpeted flooring). The reason why we chose this over the rest is because it comes with a kitchen. Eating out in Norway is very expensive. A Burger King meal cost around SGD$20-30 and a 500ml mineral water cost SGD$8. So we concluded that we should cook our own meals, which we did! The entire apartment is very clean, spacious, comfortable bed, heater works wonderful, check-in and check-out are a breeze. I will recommend this hotel if you are staying in the city center! We spent the next morning walking around the city center. It’s a small town. Very quiet and serene place. One of their many restaurants. I love how much effort they put into their architecture. Even with the generous serving of gravel for our winter boots, the roads were still very slippery. The people there are super nice and friendly. In a particular instance, we were jaywalking (oops) rather slowly because of the icy road. The driver stopped (he didn’t have to) and patiently waited for us to cross. He even smiled at us! Feeling so much love from them. I can’t say the same for their neighbour next door, Oslo. The airport staff wasn’t particularly helpful when we needed help. But aiya not surprising given that Europeans are generally quite racist (yes sweeping statement). 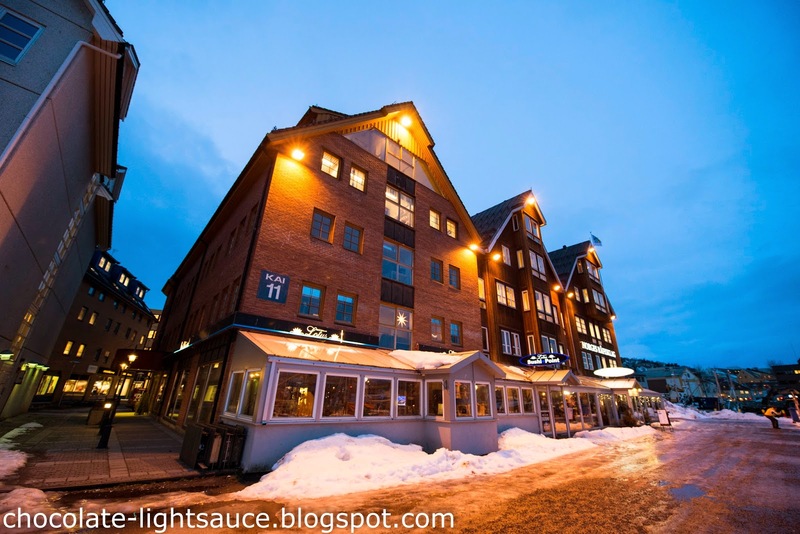 There are 3 things you should take note of when you visit Norway in Winter. 1) It’s super cold. Be prepared for –20 degrees Celsius. 2) It’s super expensive omg (unless you super rich then this probably won’t matter to you). Be prepared to spend (then be broke like me hahhaha #noregrets). 3) It’s super dark. There’s basically no sunlight, just twilight. All the photos above were taken at 10am. HAHHA. The sun rises at 10am and sets at 2pm. Reached this captivating spot and it reminded me of the jigsaw puzzle I had when I was young. Cottage houses on the bank of the river and the mountain. Postcard moment. Attempted some selfie while waiting for Mr Gan to take his photo. Results of a DSLR. Makes my Iphone seems crappy. hhahaha. The weather was rather ominous that day, it looked as though it will snow any moment which is worrying because that will affect the chance of us seeing the northern lights. After walking for quite awhile, we returned to City Living Hotel to wait for the driver we booked to fetch us to our accommodation by the Fjords. We totally enjoyed our stay at Lauklines. Can I give it a 10 stars out of 5 stars? 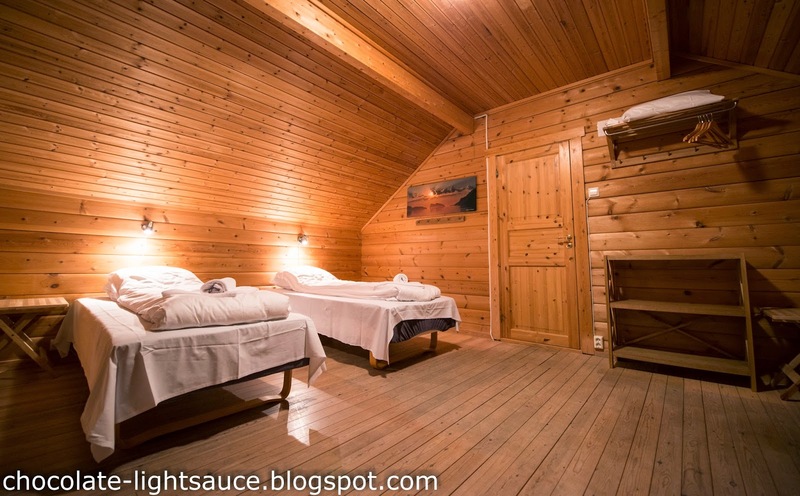 At Lauklines, there are a total of 12 cabins and each can house up to 6 people. Not the hostel kind, like 1 family per cabin/house. So Mr Gan and I had the entire 2 story house/cabin to us. AWESOME. And because there are only 12 cabins, you got to book early! While having a chat with the receptionist there, I casually asked how’s their booking like, and how many months in advance should we book if we are intending to come back in summer (Summer is totally different there!) They mentioned that people normally book 1 year in advance, so when we were there during winter, their summer 2015 rooms were fully booked. WOW so better book early! 1) You select the dates you want from their website. We chose bank transfer over credit card because we don’t feel that comfortable sending our credit card details to third party no matter how reputable they are. The bank transfer works differently from how our local bank transfer works. It’s more like a telegraphic transfer? because it involves an overseas bank. We used DBS and there’s administrative charges for every transaction. Hence we paid made 100% payment upfront. Then we email them to get a confirmation. And because the price is quoted in NOK, you got to convert the amount to SGD first before transferring. I think it cost around SGD$300-400 per night. hahaha. not that affjordable afterall. This was a long exposure shot taken with Mr Gan’s DSLR. My iphone can’t even capture anything because it was pitch dark. These were captured with my iphone. HAHAAH I feel embarrassed showing them. 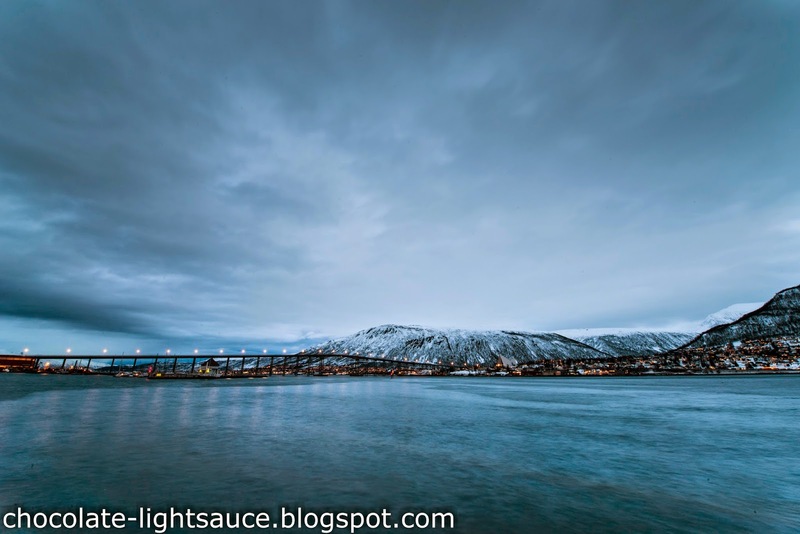 Lauklines is located around an hour drive away from Tromso Airport and there’s no public transportation. So the only way to get there is either by taxi or by driving. During the booking of the accommodation, you can select whether you want to hire a taxi. They will then help you arrange for taxi to and from Lauklines. And hahhahah. it cost SGD$400 both ways. I know its expensive but driving cost around the same and we aren’t all too comfortable with driving because its winter and left hand driving and its our first time there. I will strongly suggest that you book their taxi service if you are not going to drive because it cost a lot more to get a taxi yourselves when you are there. And it’s not likely that there will be taxi from Lauklines given how remote the place is. And because Mr Gan chatted with the driver, (his command of English and accent is a lot better than mine + he stayed in UK for awhile already) the driver even willingly drove us to see reindeers. HAHAHHA. And around Lauklines, there’s no restaurant nearby. 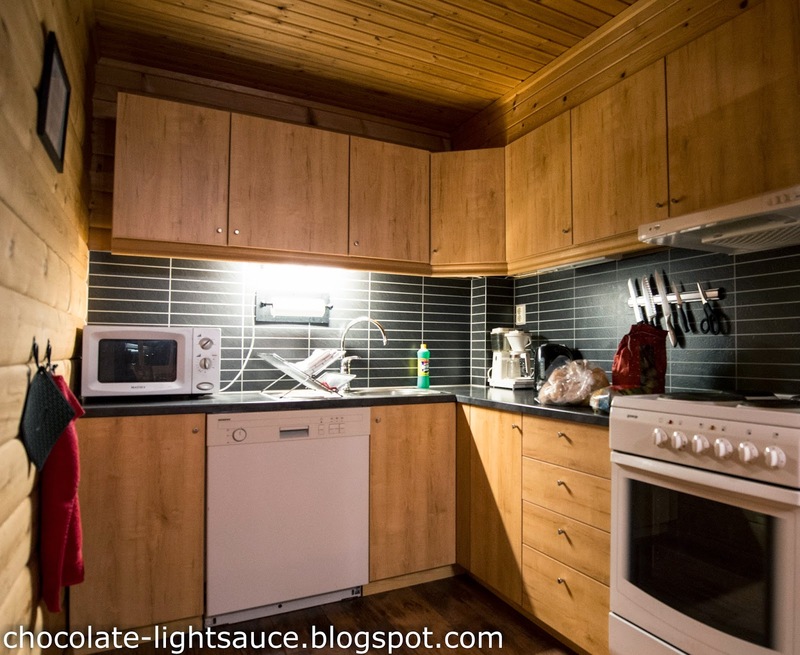 (You won’t want to eat restaurant at Norway anyway cause its very expensive) So you have to cook. 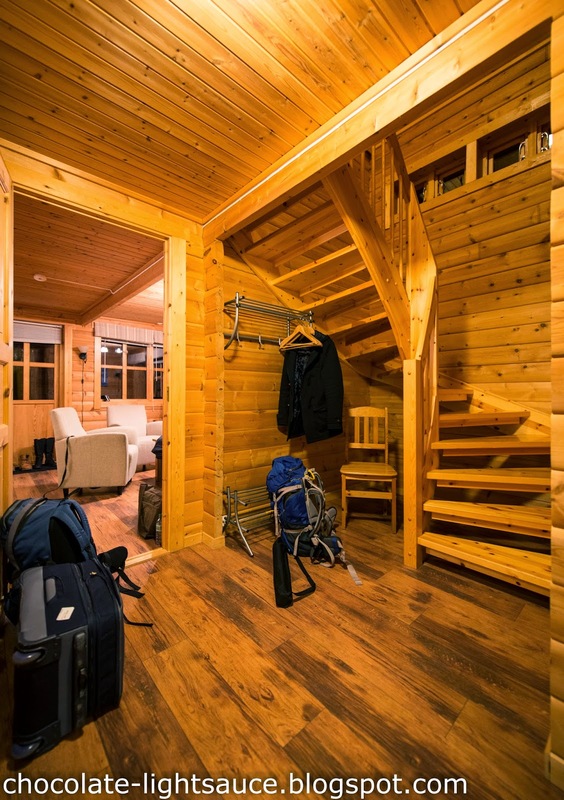 The cabin comes with a fully equipped with kitchen (Oven, microwave, stove, dishwasher, lots of pots and pans and cups and plates and knife EVERYTHING). The cabin is entirely made up of wood, including the toilet. When we were there, the owner told us that the whales are in the fjords now which means that they might swim past our cabin!! What a pleasure! But we didn’t have the chance to see them cause we weren’t around when it was bright #regret #shouldhavestaylonger. We might have heard them though. Up close and personal with the friendly wildlife. And the most important thing was..
WE GOT TO SEE THE NORTHERN LIGHTS!!! FROM RIGHT OUTSIDE OUR CABIN. BE PREPARED TO BE BLOWN AWAY BY THE PHOTOS. HAHAHAH. We chose not to go on the northern light chase because it’s not 100% that you can see the light and you will be subjected to the freezing cold the whole night. And its literally freezing. The temperature there can go down to –20degree Celcius. In comparison, by staying at Lauklines, we have the same chance of seeing the lights, perhaps we just couldn’t go and chase it, in the comfort of our cabin. With toilet and food and we can take turns to camp. So this was why we rather pay more for the cabin than go for the chase. Some Northern Light Chase bus comes with toilet, if you are wondering! 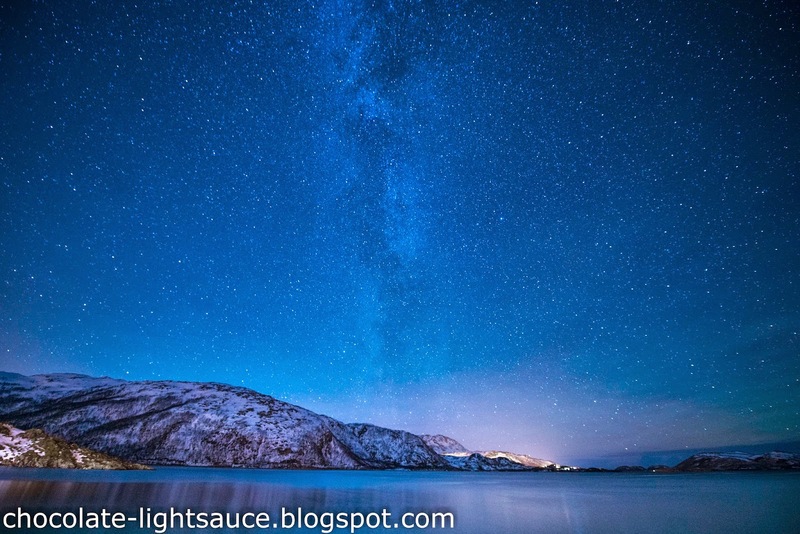 Apart from the northern lights, you can also see the Nebula and Milky Way. The skies, so full of stars. I really wish I can go back there now. 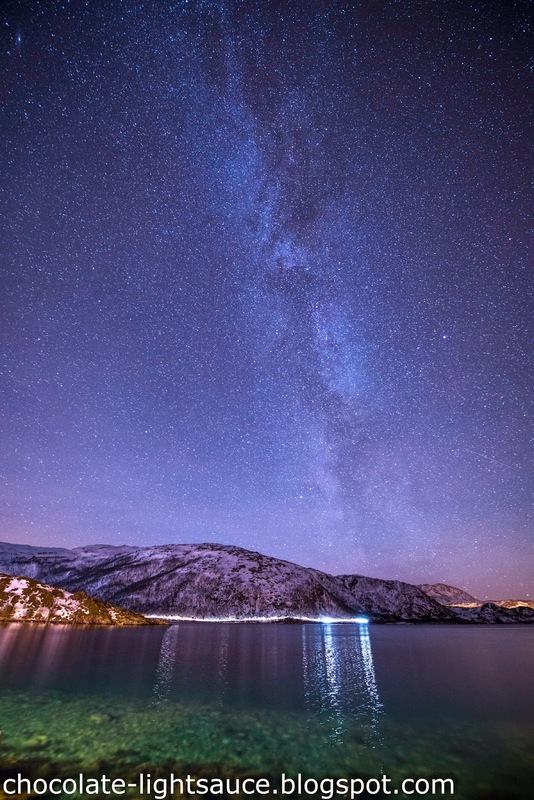 Ending this post with the gorgeous view of the milky way. My next post will be on dog sledding. Which was equally exciting!! Beautiful!!!! and very informative! Thanks for sharing! where does the taxi driver pick you up in city centre to go to Lauklines? 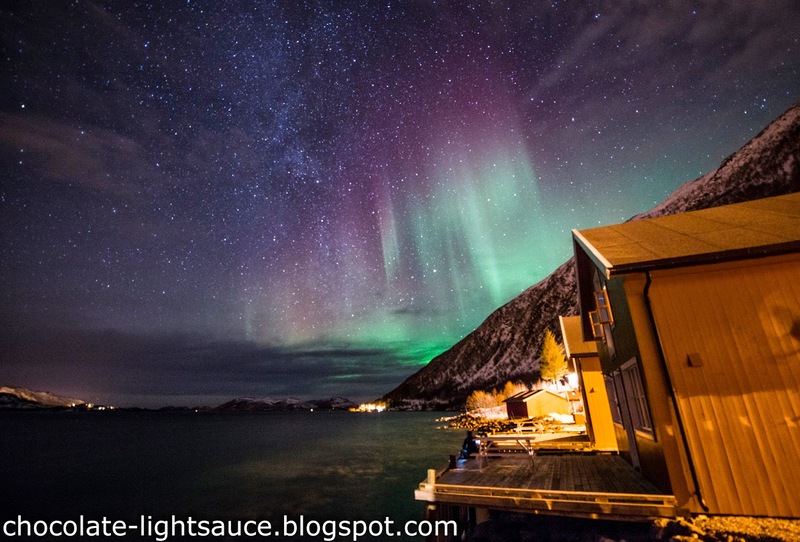 Hi Jane, can share which model of the DSLR and settings used to capture the Aurora? Beautiful shots! Thanks. Tan. Depends on how bright the lights are. The exposure was quite long as the lights were relatively dim.